This week’s #5days5ways was the most heated ingredient competition yet! 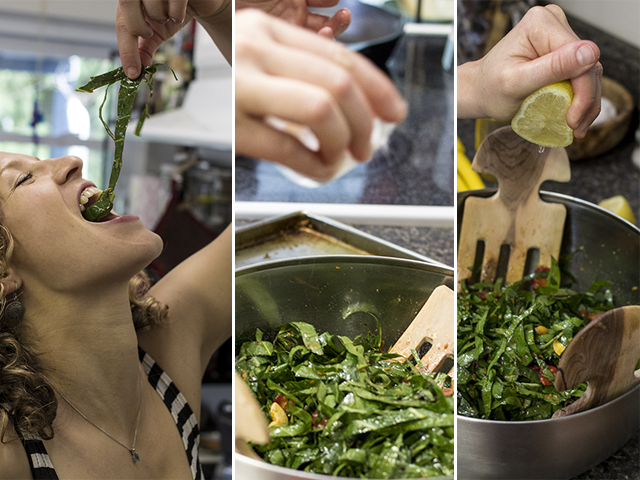 I was flooded with thoughtful requests, but the loud and resounding winner was Collard Greens. Truth be told, collards are a nice entry for any hearty green like kale and chard, which were also requested this week. So hopefully this will help you get your summer green on! 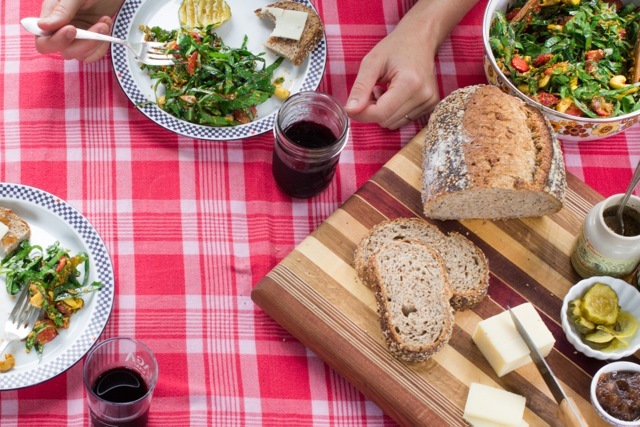 This picnic-worthy salad includes a recipe that will teach you how to make a simple, crowd-pleasing Honey Mustard Dressing to keep on hand in the fridge for all your salads, sandwich-dipping, and marinating meat and veggies for the grill. I’m blessed to have Andy Noyes working with me this summer. 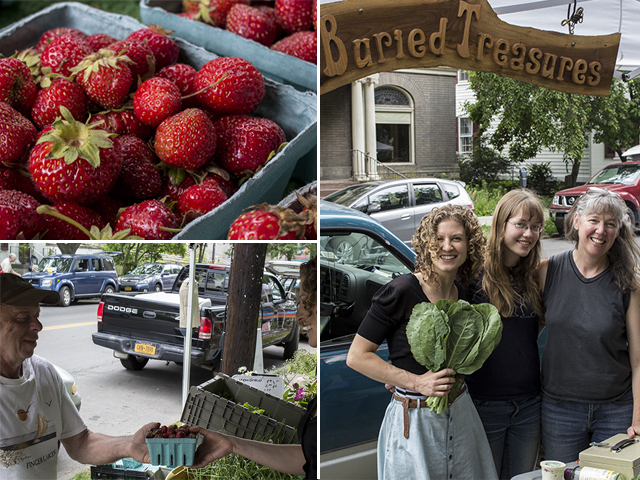 He is the former chef and table-to-farm mastermind at Northstar in Ithaca, our neighborhood pub. 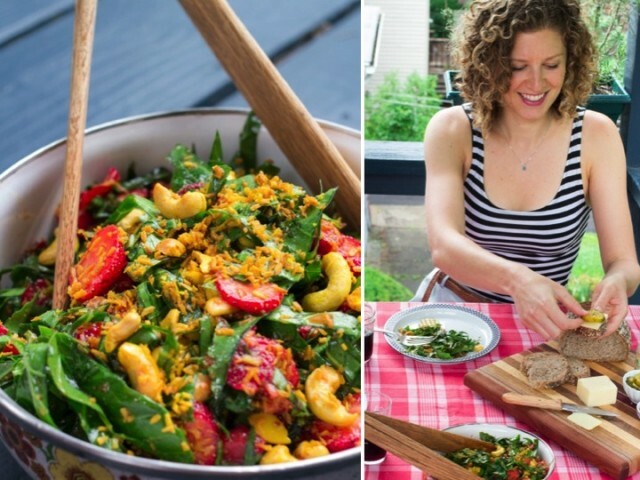 He’s moving into the world of photography, which means I don’t have to hold my Cannon at awkward angles while cooking, but can do what I do best – cook – while Andy snaps shots and gives me invaluable kitchen tips along the way. During a stint in Mobile, Alabama, Andy learned “everything you need to know about collards.” After all, this vegetable rules the garden patch down south! He said he met families who had washing machines dedicated to cleaning collards. (On Millstone Farm we used a dryer to spin our salad greens). He showed me how to strip the leaves from collards to remove the stems. The reason you often find collards braised or stewed, especially in soul food, is because they tend to be bitter. In early summer, however, they are tender and sweet. The stems are the most bitter part, and better off saving for soup broth or pickling. Hold the stem with the back side of the leaf facing up. Pinch both sides of the stem at the base of the leaf, and pull up towards the narrow end of the stem. Stack the leaves and separate the stems for later us. 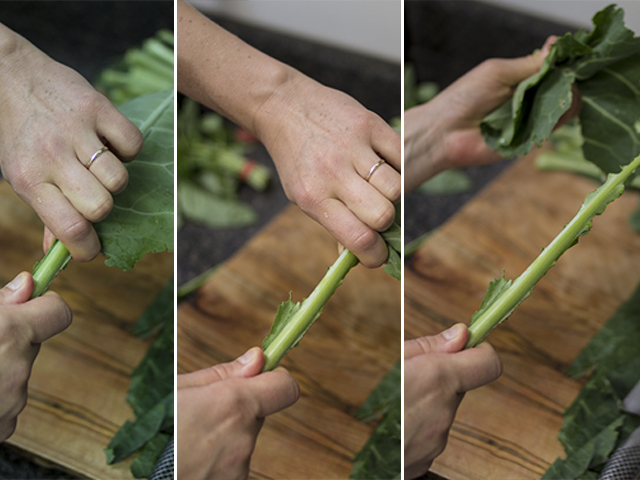 Once the leaves are stacked, you can roll them like a burrito and slice the burrito into thin slivers, making perfect collard strands for your salad. 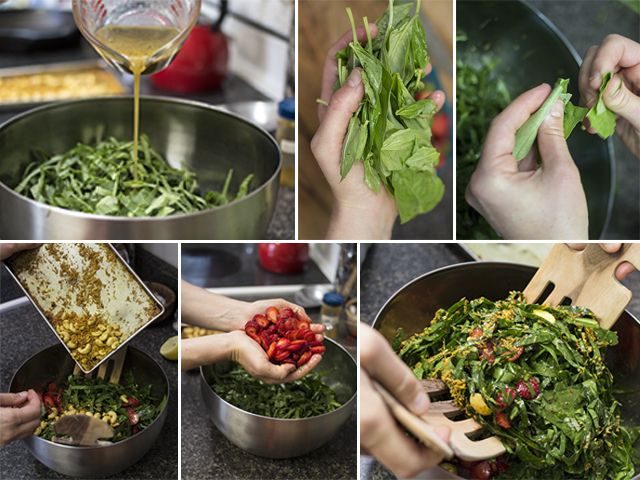 This is a quick, refreshing salad recipe that requires minimal cooking. Triple the dressing to store extra. Interchange the collards for kale, chard or any salad greens - the results will be just as good, if not better! 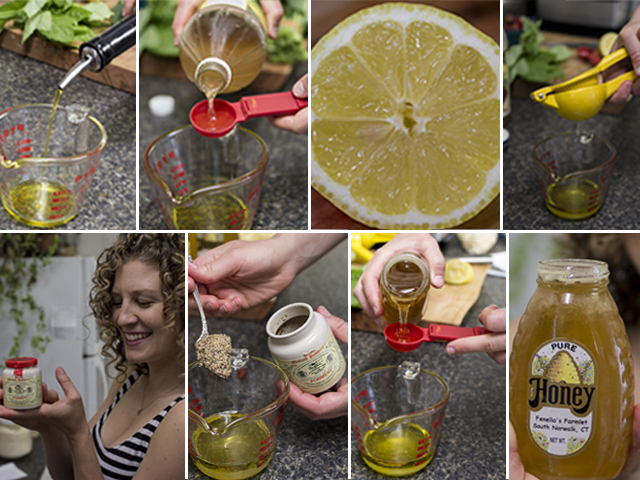 To make the Honey-Mustard Dressing: Combine the olive oil, lemon juice, honey, apple cider vinegar, stone ground mustard, pepper, and salt in a jar. Seal tightly and shake vigorously until incorporated. Store in the refrigerator for up to 3 weeks. 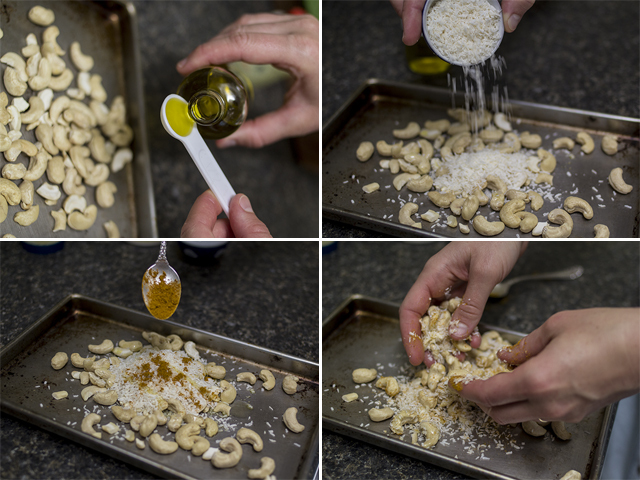 To make the Coconut-Curried Cashews: Preheat the oven to 350. Combine the cashews, shredded coconut, olive oil and curry powder on a rimmed baking sheet and mix together with your fingers. Bake for 12 minutes, until the coconut shreds are toasted in color. 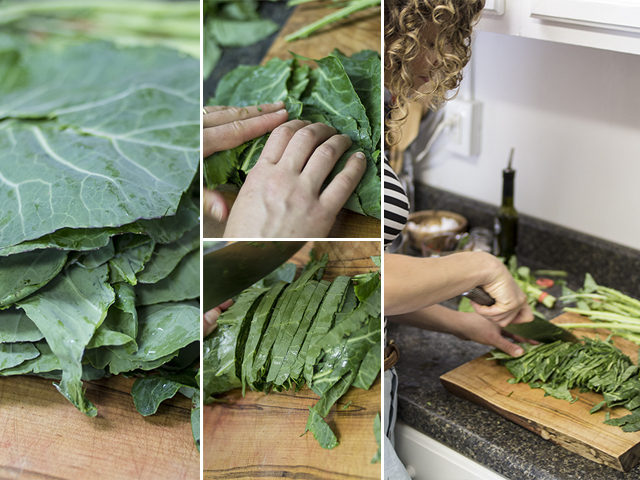 Strip the collards greens from the stem. Hold the stem with the back side of the leaf facing up. Pinch both sides of the stem at the base of the leaf, and pull up towards the narrow end of the stem. Stack the leaves and compost the stems. Roll the leaves like a burrito and slice into thin slivers to make ribbons. Transfer to a large serving bowl. 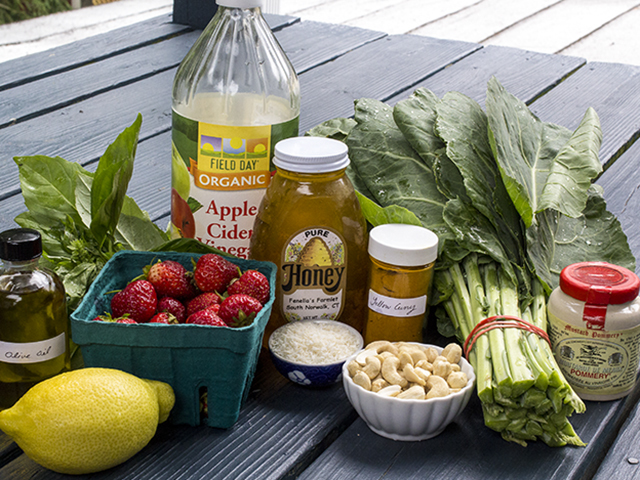 Pour the dressing over the collard greens and massage the dressing into the greens with your hands. This will make the greens more tender and easily digested. Just before serving, scatter the strawberries and cashews over top. Serve immediately, or chill until ready to serve. Store leftovers in a lidded container for up to 2 days. Emma's Food Network Star Episode 4 Recap: Rrrrrrrrreeses Makes Everyone a Star!